David Sekera, CFA, is managing director of corporate bond ratings and research for Morningstar Credit Ratings, LLC. Risk assets continued to trade up across the board last week. The markets were lifted by the rising momentum from the ongoing rebound after markets bottomed out in December as well as better-than-expected economic metrics in the United States and China. With the markets in a risk-on mood, prices for safe-haven assets such as U.S. Treasury bonds weakened, leading to a further rise in interest rates across the yield curve. In the U.S, the consumer price index rose 1.9% on a year-over-year basis; after excluding food and energy, the CPI rose 2.0% compared with last year, spot on with the Federal Reserve's targeted inflationary rate. The headline producer price index rose slightly faster than the Fed's target, but the core PPI, which excludes food, energy, and trade services, was also in line at a 2.2% year-over-year rate of increase. Jobless claims came in lower than expected and indicated a strong demand for workers. The improvement among economic metrics over the past few weeks has led to a significant increase in the Federal Reserve Bank of Atlanta's GDP Nowcast projection for first-quarter 2019 GDP growth. The Nowcast projection has risen to 2.3% after hitting a low of 0.2% at the beginning of March. In China, government data indicated that lending among the Chinese banks grew dramatically in March and exports expanded after contracting in February. These factors were enough information for investors to infer that economic growth in China is on the upswing. 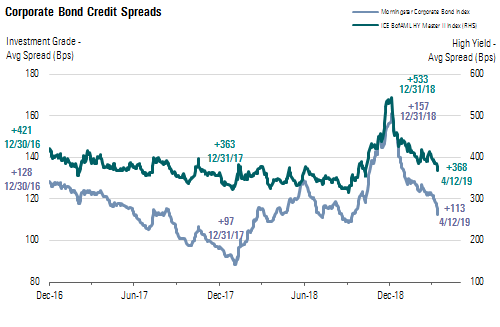 In the corporate bond market, the average credit spread of the Morningstar Corporate Bond Index (our proxy for the investment-grade corporate bond market) tightened 6 basis points to +113. In the high-yield market, the average spread of the ICE BofAML High Yield Master II Index tightened 18 basis points to +368. After hitting their lowest rates of the past year at the end of March, yields on Treasury bonds have risen as their prices have fallen. Last week, yields rose 5 basis points on the short end of the curve and 8 basis points on the longer end of the curve. At the end of the week, the yields on 2-, 5-, 10-, and 30-year bonds were 2.39%, 2.38%, 2.57%, and 2.98%, respectively. In the equity market, the S&P 500 rose 0.51%, breaching the psychological barrier of 2,900. It is currently only about 1% away from its all-time highs. 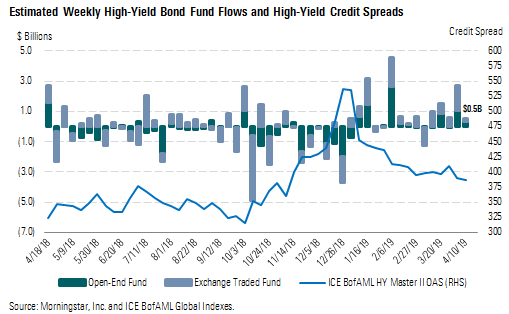 Fund flows into the high-yield asset class dwindled to $0.5 billion, consisting of $0.3 billion of inflows among open-end high-yield mutual funds and only $0.2 billion of net unit creation across high-yield exchange-traded funds. Year to date, total inflows into the high-yield asset class are $15.0 billion, consisting of $8.5 billion worth of net unit creation among high-yield exchange-traded funds and $6.5 billion of inflows across high-yield open-end mutual funds. Morningstar Credit Ratings, LLC is a credit rating agency registered with the Securities and Exchange Commission as a nationally recognized statistical rating organization ("NRSRO"). Under its NRSRO registration, Morningstar Credit Ratings issues credit ratings on financial institutions (e.g., banks), corporate issuers, and asset-backed securities. While Morningstar Credit Ratings issues credit ratings on insurance companies, those ratings are not issued under its NRSRO registration. All Morningstar credit ratings and related analysis contained herein are solely statements of opinion and not statements of fact or recommendations to purchase, hold, or sell any securities or make any other investment decisions. Morningstar credit ratings and related analysis should not be considered without an understanding and review of our methodologies, disclaimers, disclosures, and other important information found at //ratingagency.morningstar.com.